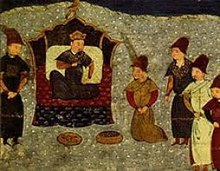 Batu Khan on the throne o the Gowden Horde. Batu Khan (Mongolian: Бат хаан‎, Bat haan, Tatar Cyrillic: Бату хан, Laitin: Batu xan, Arabic: باتو خان, Cheenese: 拔都 Bá dū, Roushie: хан Баты́й, khan Baty, Greek: Μπατού; c. 1207–1255), an aa kent as Sain Khan (Mongolian: Guid Khan‎, Сайн хаан, Sain hán) an Tsar Batu, wis a Mongol ruler an foonder o the Gowden Horde, diveesion o the Mongol Empire. This page wis last eeditit on 22 Februar 2018, at 07:14.